From the beginning, our success has been propelled by an energetic core of Chicago Public Schools (CPS) that believe in the importance of sustainability for our students’ future. Our continued success relies on this core. Since 2008, Climate Cycle has procured 65 green schools projects (including 15 solar panel installations) across 20 schools (19 of them CPS) and presented to over 25,000 students on the importance of sustainability and the urgency of the climate crisis, along with solutions and opportunities to address it. 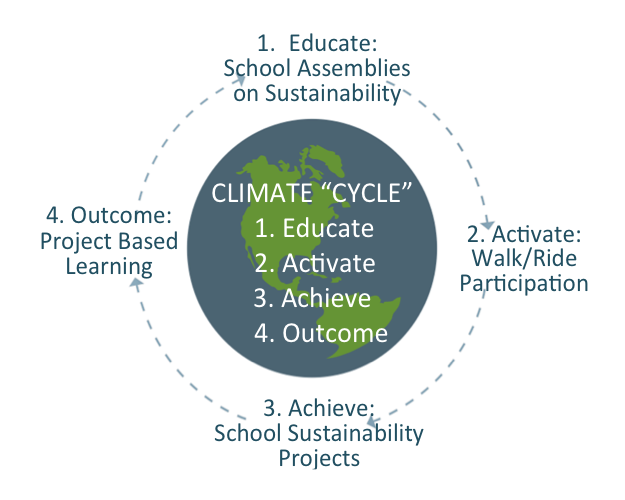 Four components comprise the crux of Climate Cycle’s school programming (see graphic below). 1. Sustainability Assembly Series: Students are educated on environmental challenges, solutions, and the rich history of social movements in America that precipitate the subsequent call to action. 2. Ride/Stride to Recharge: Following our presentation series, a key activation point for school involvement is our annual ride/walk in Grant Park. Since 2009, 2000 participants have raised $450,000 in pledges to support Climate Cycle’s Green Schools Projects. 3. Green Schools Projects: Participating schools are eligible for Climate Cycle’s Green Schools Grants program, which includes solar panel installations, pedal powered classrooms, school gardens and more. Programmatic support is also included. 4. Project Based Learning: Green Schools Projects and inter-assembly exercises that focus on reducing student’s environmental footprint both enrich education and empower hands-on learning.